Centre Animal Hospital in State College, PA is a full service companion animal hospital. We understand the special role your pet plays in your family and are dedicated to becoming your partner in your pet's health care. We treat every client as though they were family and every pet as if they were our own. Our goal is to practice the highest quality medicine and surgery with compassion and an emphasis on client education. Our entire healthcare team is committed to providing personal attention to the unique concerns of each individual pet owner. It is our commitment to provide quality veterinary care throughout the life of your pet. Our services and facilities are designed to assist in routine preventive care for young, healthy pets; early detection and treatment of disease as your pet ages; and complete medical, surgical and dental care as necessary during his or her lifetime. Our facility includes a well-stocked pharmacy, in-hospital surgery suite, in-house x-ray capabilities, a closely supervised hospitalization area and indoor kennels for hospitalized patients. Is your pet stressed, fearful or anxious when you come to the animal hospital? All of our staff at CAH has successfully completed Fear Free education and certification. We now have many techniques to call upon to help your pet's visit be fear and stress free. We are proud that our team is evolving with veterinary medicine and are committed to supporting both your pet's physical and emotional well-being. Stop in for a treat and weight check with your dog or cat - a quick visit with a food reward can help to teach your furry family member not to worry about a trip to the vet. If your pet is already anxious, please call us before scheduling an appointment. Pheromones, anti-anxiety medications, and special in-home handling techniques can help to make the whole visit more fear free. 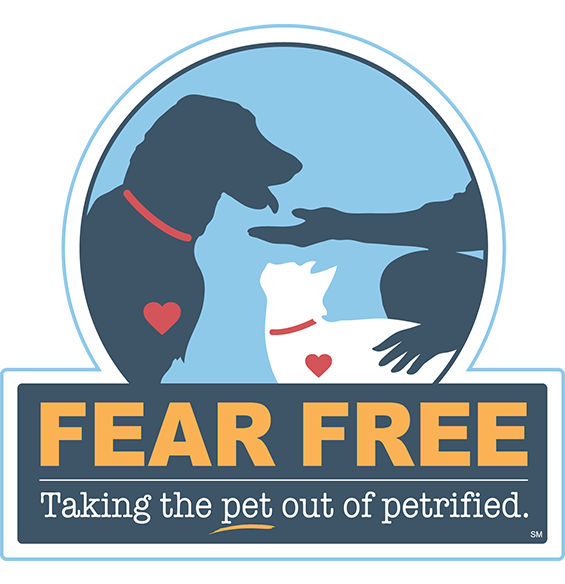 We strive to make your visits to the vet free from fear, anxiety and stress. We hope this will help both you and your pet look forward to visiting our office. Centre Animal Hospital is committed to providing prescription medications that are safe, effective and affordable. Save time by just ordering your medication through our online pharmacy and your veterinarian will approve the prescription and record it in you pet’s medical record. 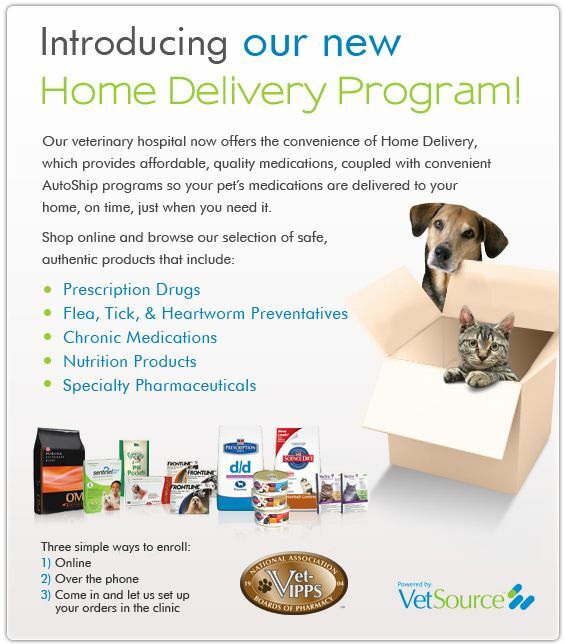 Your pet’s prescription will be delivered right to your door. Our online pharmacy offers a variety of products from non-steroid painkillers, to pill pockets. Visit Centre Animal Hospital's online pharmacy now!